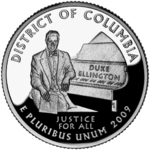 The District of Columbia and United States Territories Quarter Program was a one-year coin program of the United States Mint that saw quarters being minted in 2009 to honor the District of Columbia and the unincorporated United States insular areas of Puerto Rico, Guam, United States Virgin Islands, American Samoa, and the Northern Mariana Islands. The islands commonly grouped together as the United States Minor Outlying Islands were not featured, as the law defined the word "territory" as being limited to the areas mentioned above. It followed the completion of the 50 State Quarters program. The coins used the same George Washington obverse as with the quarters of the previous ten years. The reverse of the quarters featured a design selected by the Mint depicting each territory/federal district. Unlike on the 50 State quarters, the motto "E Pluribus Unum" will precede and be the same size as the mint date on the reverse.